This month, Rosa Sabido, a 53-year old woman of “impeccable character,” became the 11th person nationwide currently in sanctuary in a church. The other churches providing sanctuary sit in metropolitan areas such as Albuquerque, Chicago and Phoenix. 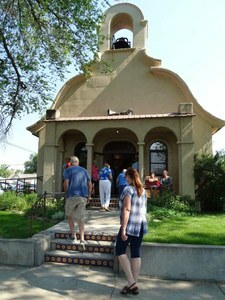 The next smallest congregation is in Las Cruces, New Mexico, a city of 98,000. By comparison, the Mancos United Methodist Church, which sits on a quiet road off Highway 160 in Mancos, Colorado, and has 55 members, seems tiny and vulnerable. But don’t let the scene fool you. Congregations in small, rural Western towns might be the perfect place to challenge the faceless, fearful narrative dominating the national rhetoric. The congregation of the Mancos United Methodist Church voted to provide immigrants sanctuary months ago, and recently provided Sabido a haven. For years, Sabido has worked as a church secretary in Cortez, and since 2008 she has applied annually (at a cost of $5,000 a pop) for stays of deportation while her legal status remained pending. Since arriving in the U.S. as a young adult, she has paid taxes and has no criminal record, according to her attorney Jennifer Kane-Rios from Lakewood, Colorado. Sabido knows Mancos. This town of 1,400 trumpets itself as a place “where the West still lives.” There are regular cattle drives through town and it has a new state-recognized creative district where artists mingle. Like many of us, Sabido often stops at the P & D grocery store, for a drink and a chat. We might not all agree, but we know each other. We meet at the P & D, the post office, the coffee shops and the library (where The Lives of Muhammad sits next a book by Bill O’Reilly on the new non-fiction shelf). We recognize each other’s vehicles. We learn each other’s routines. The church nursery is now her bedroom. A hand-painted mural of Noah’s Ark watches over a twin bed, a chair and some personal items. The room will become even smaller as volunteers work to add a bathroom. Next door, the pastor’s office also has a twin bed squeezed in for overnight sanctuary volunteers. There is an air of temporariness, but Pastor Craig Paschal and his parishioners put the wheels in motion months ago when they voted to accept immigrants seeking sanctuary. At the time, there were about 20 cases nationwide. Paschal thought the vote was largely symbolic. “What are the odds?” he recalled thinking. “In my 13 years here, never once did I think of anyone’s immigration status,” he said. “But we got to thinking: ‘How can we call ourselves a church if we don’t love our neighbors?’” This winter, Paschal attended sanctuary training in Denver. 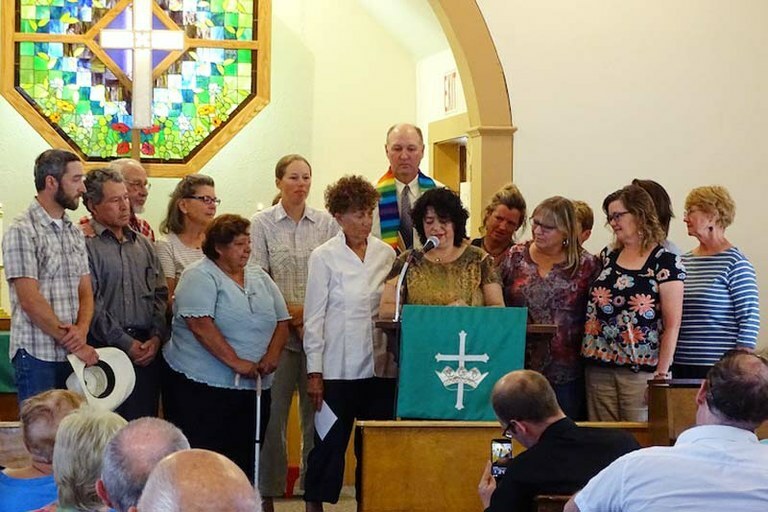 When Sabido’s situation became precarious, the call to action followed a neighborly route that might not have worked so smoothly in a bigger town: She talked with a fellow member of the Montelores Catholic Community who knew about the sanctuary work of the Mancos Methodists. Sabido got Paschal’s email and reached him over Memorial Day weekend, asking for help. Kane-Rios told her that if she attended her appointment with ICE, “there is a 100 percent possibility that you will be detained,” Sabido said. Instead, on June 2, Sabido drove her 1995 Toyota Corolla from her doublewide mobile home in Cortez to the fellowship hall on Oak Street. She has yet to leave the quarter-acre property. When you hike up nearby Menefee Peak above town, you can look down on almost everyone’s home in Mancos Valley. In a town this small, adversaries are never anonymous. We might fear bears or mountain lions, but rarely neighbors. The rhetoric from Washington doesn’t stick. Rose Sabido speaks in the Mancos United Methodist Church where she has found sanctuary from immigration enforcement. Maddy Butcher is a writer in Mancos, Colorado.